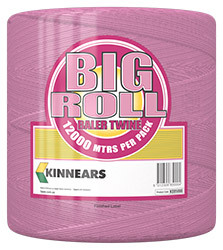 One of the longest serving brands of baling twine sold in Australia, Big Roll® comes from the Kinnear’s family of twines, now owned and manufactured by Tapex. Big Roll® is the perfect length for round bales when reduced down-time and reliability is priority. Offering ideal strength for tight compact bales. For baling low to medium density round bales. Bright pink colour for clear visibility on and off the bale.